Custom Printed Sprint Polarized Sunglasses are excellent especially because of their sleek style and practical features. These custom sport sunglasses consist of a matte Black wrap style along with polarized smoke lens which gives a cool experience for the users even in the hottest seasons. 100% UV protection, 1" W x 1/4" H and 5/8" W x 3/16" H imprint areas in the lens and temple respectively are other major factors that make these custom sunglasses exceptional for outdoor events in beaches or in sports venues. Order today to enjoy our free artwork design and free online proofs facilities. 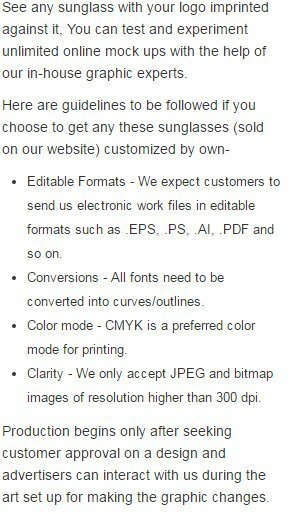 Request a quote to know what you can save on ordering Custom Imprinted Solar Shade Shiny Sunglasses.